What’s included in the rate for the luxury homes? Luxury home rates include three meals per day, per person; all listed complimentary activities; round-trip airport shuttle service (one time per group) from/to Missoula International Airport (a $150 value); on-property transportation; beverages and all other listed amenities in each home and private access to 37,000 acres of pristine Montana wilderness. How many luxury homes are available at Paws Up? Paws Up has 28 luxury homes. The Resort offers one-bedroom homes, two-bedroom homes, three-bedroom homes and four-bedroom homes. For guest capacities and additional home details, please refer to each home’s individual web page. Are the luxury homes located close to the Village at Paws Up? The Meadow Homes, Big Timber Homes and Wilderness Estates are located adjacent to the Village at Paws Up. The Blackfoot River Lodge and Morris Ranch House are each located just a short drive from the Village. Which luxury homes have a fireplace? The Big Timber Homes, Wilderness Estates and Blackfoot River Lodge feature spacious great rooms with large natural stone and timber fireplaces. The Big Timber Homes have wood-burning stoves. Are dogs allowed in the luxury homes? Dogs are allowed in specified dog-friendly homes. There is a nightly pet fee, which includes a host of amenities to help your best canine friend feel as comfortable as you do. Some restrictions apply. Which is the most luxurious home at Paws Up? Each home at Paws Up boasts an unrivaled level of luxury. Our newest and most luxurious homes are the Wilderness Estates. They are The Resort’s largest homes, and each features three separate, private master suites with en suite bathrooms—making them the ultimate accommodation for families and groups. How do I determine which luxury home is best for my family? Each luxury home at Paws Up is spacious and has a unique layout, offering a variety of options that will cater to the size and specific needs of your family or group. We encourage you to look at each home’s floor plan on their individual web pages to see the varied features and amenities. 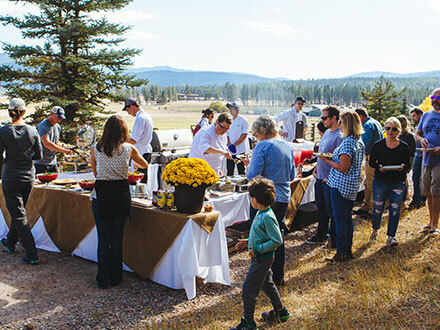 Should you have additional questions in regards to choosing the perfect luxury home for your vacation at Paws Up, please contact one of our reservation specialists at 800-473-0601. What are the dining options when staying in a luxury home? Breakfast and lunch are served at Trough, our casual dining restaurant. Dinner is served at Pomp, our award-winning fine-dining restaurant. Family-style dinners are available nightly at Trough. Tank, our full-service bar, is also open nightly. All homes have a kitchen equipped with a refrigerator, dishwasher, microwave, toaster and coffeemaker. All Wilderness Estates feature a full chef’s kitchen. Arrangements can be made for grocery shopping. In addition, in-home dining is available. How do I get around The Resort? All luxury homes come with the complimentary use of a five-person compact car. The cars can be used for transport to Spa Town®, the Wilderness Outpost and the Lewis & Clark Reception Barn, as well as Pomp and Tank & Trough. In addition, Paws Up provides complimentary on-property shuttle service to all guests. Do the luxury homes have air conditioning? Yes, every luxury home at Paws Up is independently climate controlled, including air conditioning. Can I stay connected at Paws Up? Cell service is available throughout the entire Resort and all the luxury homes feature complimentary Wi-Fi. Do the luxury homes have views? Each home is privately nestled amongst our 37,000 acres, providing breathtaking views of the pastoral Montana countryside. The Meadow Homes, Big Timber Homes and Wilderness Estates boast views of expansive meadows, majestic timbers and stately mountain ranges. The Morris Ranch House and Blackfoot River Lodge feature their respective views of Elk Creek and the Blackfoot River. Does Paws Up have a main lodge with individual rooms? To provide our guests with the ultimate in privacy and luxury, The Resort at Paws Up does not offer a lodge with individual rooms. We believe that rooms and suites are for city hotels. When you come to Montana, you and your family deserve to spread out in your very own home away from home.